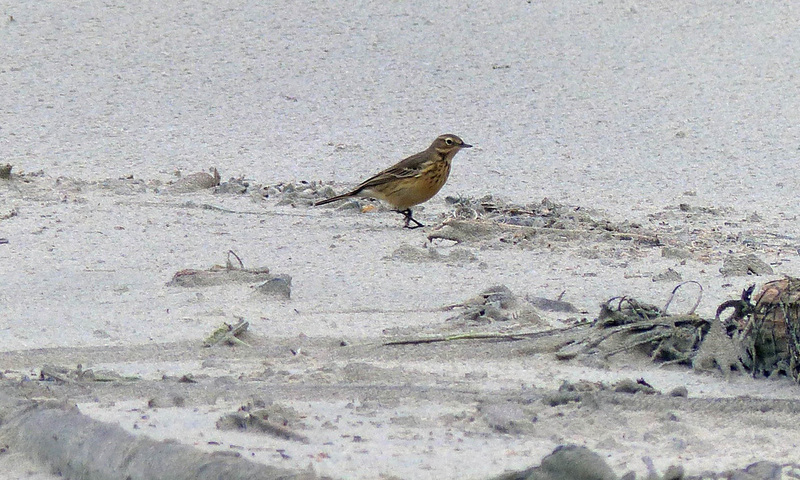 American pipit on a Calvert Island beach. Photo by Brian Starzomski. This sparrow-sized songbird is darker above and lighter below, usually with streaked underparts. During the summer breeding months its back and head are more greyish and streaking is light or absent; in winter its upper parts become more brown and streaking becomes more prominent. Streaking in both summer and winter is concentrated around the upper breast, forming a "necklace." Its wing feather tips are lighter in colour, giving the impression of wing bars when wings are folded. Its bill is thin and its legs are dark and pinkish (photo). Its tail, which it often bobs up and down, has white outer feathers. Click here to listen to its song and call. The American pipit can be found in open habitats year-round. It is mostly found on the coast of BC during migration, in such open habitats as fields, mudflats, marshes, and shorelines. It breeds on tundra and alpine slopes well above the treeline, and migrates south to winter in the coastal and southern United States as well as Mexico and Central America, where it is found in similar habitats as during migration. It is found year-round in a small area around the Salish Sea in southwestern BC and northwestern Washington. Click here for a BC-specific range map. The American pipit can be distinguished from similar-looking sparrows by its thinner beak and its habit of bobbing its tail up and down. The hermit thrush (Catharus guttatus) and Swainson's thrush (C. ustulatus) have spotted rather than streaked underparts, lighter legs, and often have more reddish backs and/or tails. American Pipit. The Birds of North America Online (A. Poole, Ed.). Ithaca: Cornell Lab of Ornithology; Retrieved from the Birds of North America Online. Accessed 31/08/2013. American Pipit Anthus rubescens. Audubon Birds. National Audubon Society. Accessed 31/08/2015. Dunn, J. L. and Alderfer, J. (Eds.). (2011). National Geographic Field Guide to the Birds of North America. (6th Ed.). Washington, D.C.: National Geographic Society. Pp. 414-415. Fenneman, J. Anthus rubescens (Tunstall). In Klinkenberg, Brian. (Ed.) E-Fauna BC: Electronic Atlas of the Fauna of British Columbia. Lab for Advanced Spatial Analysis, Department of Geography, University of British Columbia, Vancouver. Accessed 31/08/2015.